Download "BUREAU OF SECURITY AND INVESTIGATIVE SERVICES Title 16, Division 7 of the California Code of Regulations"
1 BUREAU OF SECURITY AND INVESTIGATIVE SERVICES Title 16, Division 7 of the California Code of Regulations ARTICLE 9. SKILLS TRAINING COURSE FOR SECURITY GUARDS 643. SKILLS TRAINING COURSE FOR SECURITY GUARDS (a) The course of skills training for registered security guards shall follow the standards prescribed by section (b) of the Business and Professions Code. 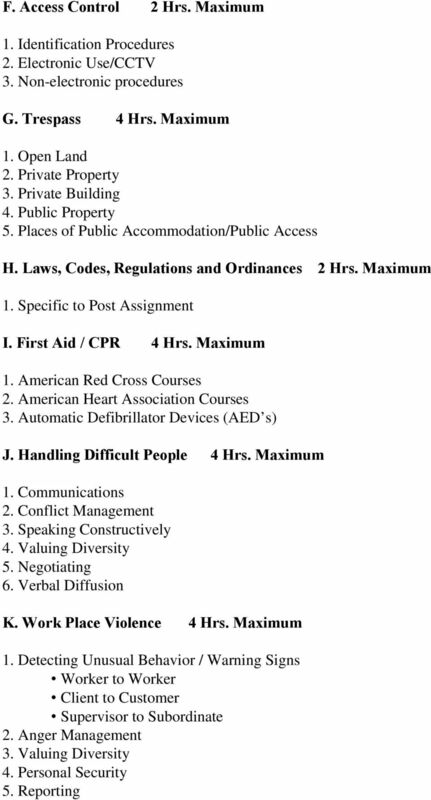 The attached Appendix sets forth the subjects that shall be taught and the maximum number of hours that shall be allowed towards meeting required training. (b) For each course, or series of courses, the institution or company providing the training shall issue a Certificate of Completion to the individual completing the course. 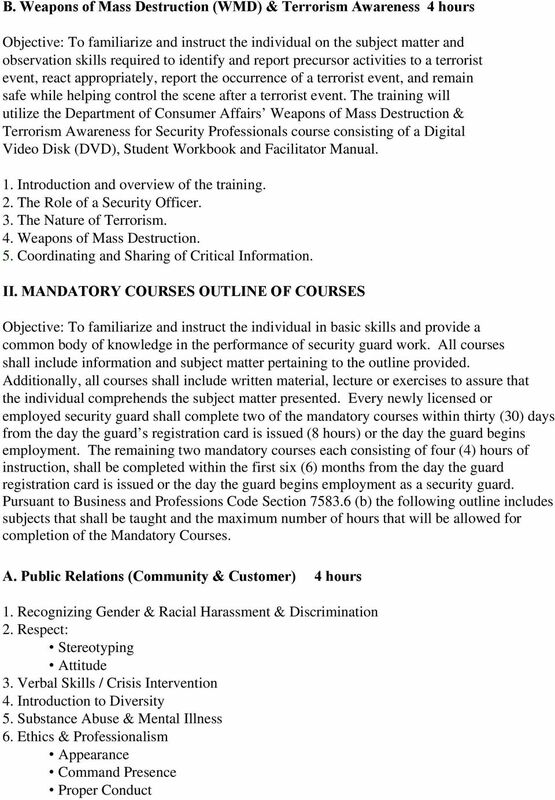 The certificate shall identify the course(s) taken, the number of hours of training provided, identification of the issuing entity, name of the individual and instructor and a date, and state that the course(s) comply with the Department of Consumer Affairs Skills Training Course for Security Guards. The certificate shall be serially numbered for tracking. Note: Authority cited: Section 7581, Business and Professions Code. Reference: Sections and , Business and Professions Code. I. POWER TO ARREST COURSE OUTLINE The Power to Arrest Course consists of four (4) hours of training in both of the following two (2) subjects: A. 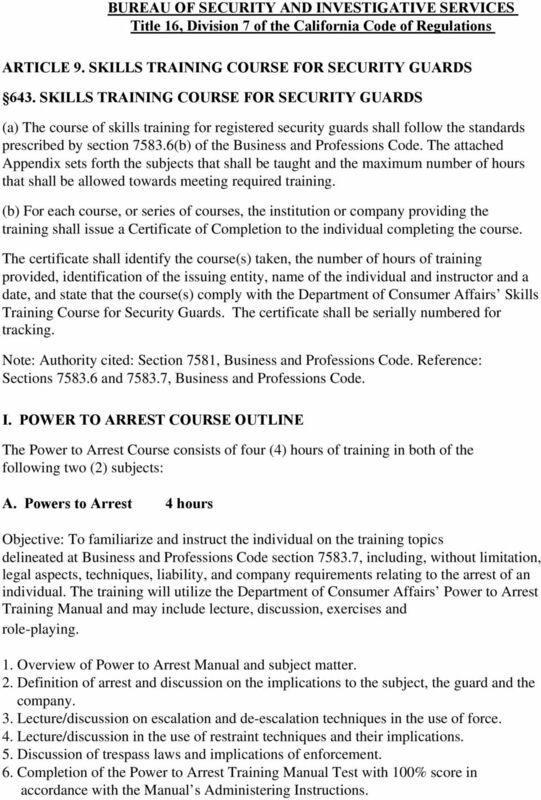 Powers to Arrest 4 hours Objective: To familiarize and instruct the individual on the training topics delineated at Business and Professions Code section , including, without limitation, legal aspects, techniques, liability, and company requirements relating to the arrest of an individual. 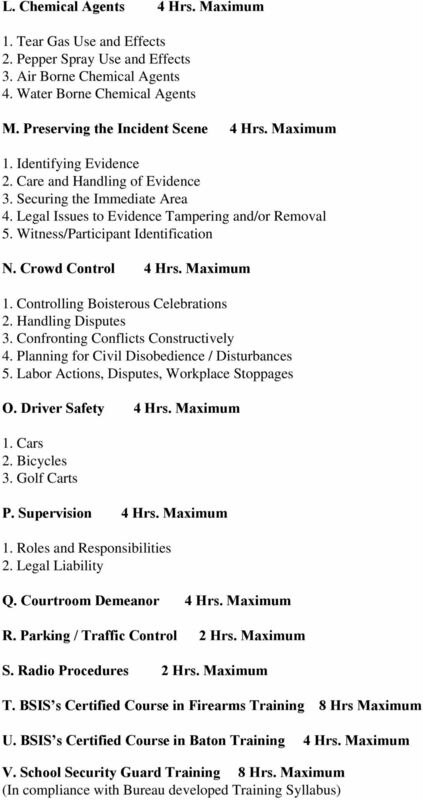 The training will utilize the Department of Consumer Affairs Power to Arrest Training Manual and may include lecture, discussion, exercises and role-playing. 1. 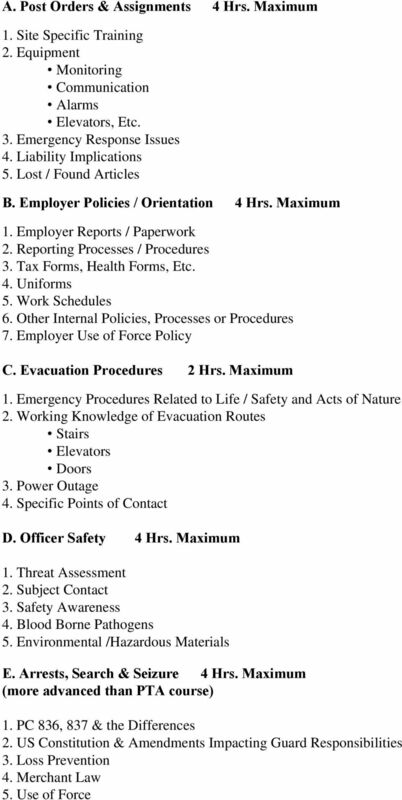 Overview of Power to Arrest Manual and subject matter. 2. Definition of arrest and discussion on the implications to the subject, the guard and the company. 3. Lecture/discussion on escalation and de-escalation techniques in the use of force. 4. Lecture/discussion in the use of restraint techniques and their implications. 5. Discussion of trespass laws and implications of enforcement. 6. Completion of the Power to Arrest Training Manual Test with 100% score in accordance with the Manual s Administering Instructions. 3 B. Observation & Documentation 4 hours 1. Report Writing 2. English as a Second Language 3. Observation and Patrol Techniques 4. Asking Appropriate Questions 5. Observing Suspects / Suspicious Activity C. Communication and its Significance 4 hours 1. Internal Protocols Pursuant to Contract (Who to Contact & When) Radio / Monitors Other Technology 2. External Emergency / First Responders Medical Personnel Police / Sheriff / Other Enforcement City Services / Government Services D. Liability / Legal Aspects 4 hours 1. Personal / Contractor / Employer 2. Criminal, Civil, Administrative 3. BSIS Code & Regulations 4. Role of a Security Guard III. ELECTIVE COURSE OUTLINES Objective: To familiarize and instruct the individual in basic employer requirements relating to the performance of guard duties. Additionally, to provide the employer and the individual with the opportunity to select additional course work to improve the skills and knowledge of the individual. The listed courses should include a mixture of written materials, lecture and exercises. The hours listed are the maximum number of hours that will be accepted as part of the 16 hours of elective training mandated by the Business and Professions Code section Every newly licensed security guard shall complete a minimum of eight (8) hours of elective courses within thirty (30) days from the day the security guard s registration card is issued or the day the guard begins employment. An additional eight (8) hours of elective courses shall be completed within the first six (6) months from the day the security guard s registration card is issued or the day the guard begins employment. 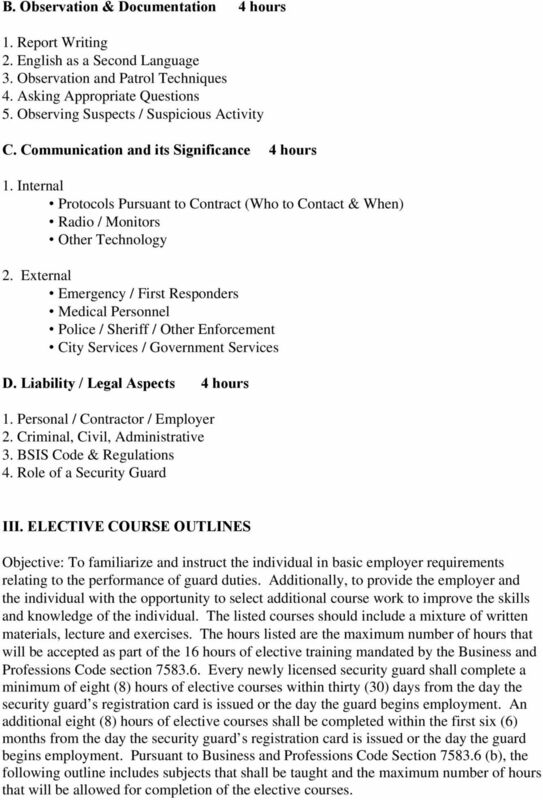 Pursuant to Business and Professions Code Section (b), the following outline includes subjects that shall be taught and the maximum number of hours that will be allowed for completion of the elective courses. 7 W. Introduction to Executive Protection 4 Hrs. Maximum X. Annual Firearms Requalification 4 Hrs. Maximum Y. Fire Safety Course 4 Hrs. Maximum Z. Course in the Use of a Stun Gun or Air Taser 4 Hrs. Maximum IV. Continuing Education Objective: To provide additional or remedial instruction in private security subject matter. The continuing education requirement, of an additional 8 hours annually pursuant to Business and Professions Code Section (f) (1), commenced on January 5, The annual training may be provided by an independent training entity or may be provided by the employer. Employer provided training should be supported by evaluation of the licensed guards skills. 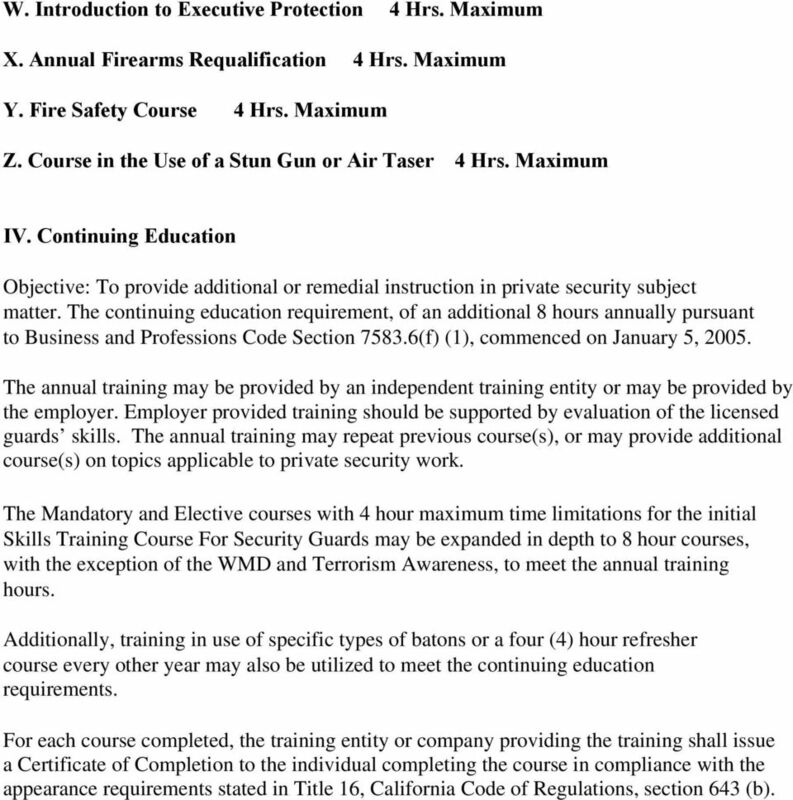 The annual training may repeat previous course(s), or may provide additional course(s) on topics applicable to private security work. The Mandatory and Elective courses with 4 hour maximum time limitations for the initial Skills Training Course For Security Guards may be expanded in depth to 8 hour courses, with the exception of the WMD and Terrorism Awareness, to meet the annual training hours. Additionally, training in use of specific types of batons or a four (4) hour refresher course every other year may also be utilized to meet the continuing education requirements. For each course completed, the training entity or company providing the training shall issue a Certificate of Completion to the individual completing the course in compliance with the appearance requirements stated in Title 16, California Code of Regulations, section 643 (b). Teacher Assessment Blueprint. Criminal Justice. Test Code: 5269 / Version: 01. Copyright 2010 NOCTI. All Rights Reserved. Executive Protection Course Fees = $5,995 (100% of costs due upon enrolment) Description of Educational Program Executive protection is its own highly specialized field within the private security industry. Job Ready Assessment Blueprint. Criminal Justice. Test Code: 4081 / Version: 01. Copyright 2012. All Rights Reserved. AN ACT. To create and establish the Office of Homeland Security in the Governor s Office; and for other purposes. OCPS Tech Centers Orlando Campus Annual Security Report 2015 2016 1. Current campus policies regarding procedures for students and others to report criminal actions or other emergencies occurring on campus. (2) Minutes shall be maintained for advisory board meetings.